I’m enamored with the Gianduja Hot Chocolate from Eataly, you know the big guy’s place in Chelsea, half marketplace, half eatery, WHOLE deliciousness… Anyway, I knew I had to concoct something similar, but also super easy, at home. 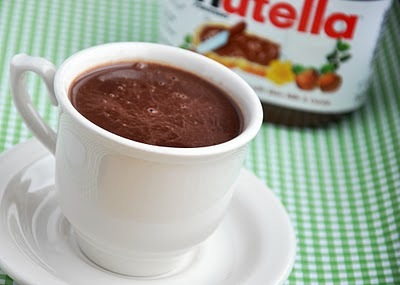 I found a recipe for a Nutella Hot Chocolate online and added my own twist — dark chocolate shavings to give it more texture. Check it out, try it out and give me your thoughts. This entry was posted on Monday, December 12th, 2011 at 3:07 pm and is filed under Recipes, Woman About Town. « A Charlie Brown Christmas Tree = Perfection!